A news feature in the journal Nature discusses how Quantum Discord is related to Quantum Computation. They interviewed several of my collaborators, Kavan Modi and Animesh Datta, and have a very nice summary of why it has become so fashionable lately. Quantum Discord was first proposed by Wojciech Zurek as a measure of bipartite quantum correlations different from entanglement. As Wojciech described it to me, he presented this at a conference, and many people did not understand its significance at the time, mainly because it wasn’t clear how it related to entanglement. Meanwhile, Vlatko Vedral independently proposed a similar measure of quantum correlations. These results were both published around 2001, but Zurek’s name stuck. A few years later, while I was in graduate school, I heard Zurek was coming to visit us in the Sudarshan group. Zurek had been a student of our department decades before, and I was very excited to meet him. I studied some of his papers, and we had a discussion that ended up on the topic of quantum discord. Although at the time I was not thinking too much about measures of quantum correlations, I was interested in the problem of initial system-environment correlations in open quantum systems. A few months later, while walking around town lake in Austin Tx, I proposed to Kavan Modi (then a graduate student like me) and Prof. Sudarshan that the concept of classical correlations (as defined by quantum discord), might help us understand some of the issues in open quantum systems with initial correlations. 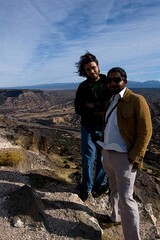 That winter, Kavan and I decided to go on a road trip to New Mexico, where we visited our friend Anil Shaji, now a postdoc in Prof. Caves group. We then also met Animesh Datta. During this road trip we also visited Zurek in Los Alamos, and we had further discussions about quantum discord. All these conversations led to the first paper to use quantum discord, which connected it to the mathematical properties of complete positivity of dynamical maps. Animesh and Anil took a different direction that ultimate proved to be very useful: they noted that quantum discord was an important resource for some quantum algorithms. It was this result that has led to so many recent publications in the field. More recently, some of us have shown how quantum discord is a fundamental dynamical characteristic of non-equilibrium thermodynamical systems. Quantum Discord has led to advances that can be grouped into two areas: as what could become another resource in quantum computation, and as some fundamental property of the dynamics of bipartite states. Could there be a relationship between these? Previous Previous post: Dirac Trivia, on TV!